Oracle GlassFish Server 3.1.2 provides an environment for developing and deploying Java applications and web services. GlassFish Server applications include Java Platform, Enterprise Edition (Java EE platform) standard features as well as features specific to GlassFish Server. This guide explains the tools and processes used for deploying applications and modules in the GlassFish Server environment. Only GlassFish Server features are described in detail in this document. Information and instructions on deploying from the command line are provided in this document. Information and instructions for accomplishing the deployment tasks by using the Administration Console are contained in the Administration Console online help. Assembly, also known as packaging, is the process of combining discrete components of an application or module into a single unit that can be installed on an application server. 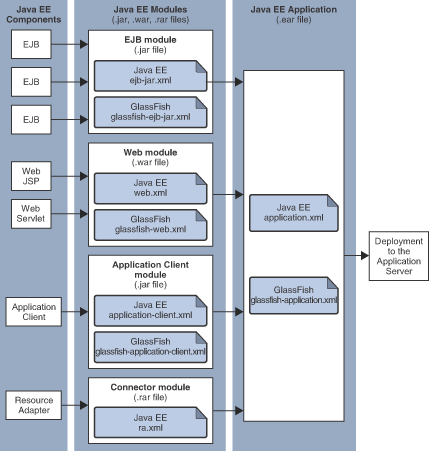 The GlassFish Server assembly process conforms to the customary Java EE specifications. The only difference is that when you assemble applications or modules in GlassFish Server, you can include optional GlassFish Server deployment descriptors that enhance functionality. Deployment is the process of installing an application or module on GlassFish Server, optionally specifying location-specific information, such as a list of local users that can access the application, or the name of the local database. GlassFish Server deployment tools expand the archive file into an open directory structure that is ready for users. GlassFish Server deployment tools are described in About Deployment Tools. Archive Deployment. Deploys the application as an archive file. For instructions, see To Deploy an Application or Module. Dynamic Reloading. Redeploys the application by creating or modifying a special .reload file in the applications repository. For instructions, see To Reload Changes to Applications or Modules Dynamically. Automatic Deployment. Deploys the application archive that is placed in the autodeployment directory. For instructions, see To Deploy an Application or Module Automatically. Directory Deployment. Deploys the application in a directory format. For instructions, see To Deploy an Application or Module in a Directory Format. JSR 88 Deployment. A deployment mechanism implemented based on the JSR 88 standard from jcp.org. It delivers vendor neutral deployment options. See JSR 88 Client and JSR 88 Naming. A deployment plan, which deploys a portable archive along with a deployment plan containing GlassFish Server deployment descriptors, can apply to any of these deployment techniques. For instructions, see To Deploy an Application or Module by Using a Deployment Plan. A development environment provides a loose set of tools and work spaces for a relatively small number of developers who are creating and testing applications and modules. A production environment provides a stable, protected environment where applications are tuned to maximum efficiency for business use rather than for development. Some deployment methods that are used effectively in a development environment should not be used in production. In addition, whenever a reload is done, the sessions that are in transit become invalid, which might not be a concern for development, but can be a serious matter in production. The client must restart the session, another negative in a production environment. For production environments, any upgrade should be performed as a rolling upgrade, which upgrades applications and modules without interruption in service. For more information, see "Upgrading Applications Without Loss of Availability" in Oracle GlassFish Server High Availability Administration Guide. A deployment descriptor is an XML file that describes how a Java EE application or module should be deployed. Each deployment descriptor XML file has a corresponding Document Type Definition (DTD) file or schema (XSD) file, which defines the elements, data, and attributes that the deployment descriptor file can contain. The deployment descriptor directs a deployment tool to deploy a module or application with specific container options, and also describes specific configuration requirements that you must resolve. Because the information in a deployment descriptor is declarative, it can be changed without requiring modifications to source code. During deployment, GlassFish Server reads the information in the deployment descriptor and deploys the application or module as directed. Java EE Standard Descriptors. Java EE standard deployment descriptors are described in the Java EE 6 specification. You can find the specification at http://www.oracle.com/technetwork/indexes/downloads/index.html. Information about the XML schemas that define Java EE standard deployment descriptors is available at http://java.sun.com/xml/ns/javaee/. GlassFish Server Descriptors. GlassFish Server provides optional deployment descriptors for configuring features that are specific to GlassFish Server. For example, when you assemble an EJB module, you annotate or create two GlassFish Server deployment descriptor files with these names: ejb-jar.xml and glassfish-ejb-jar.xml. If the EJB component is an entity bean with container-managed persistence (CMP), you can also create a .dbschema file and a sun-cmp-mapping.xml file. For complete descriptions of these files and their elements, see GlassFish Server Deployment Descriptor Files and Elements of the GlassFish Server Deployment Descriptors. Unless otherwise stated, settings in the GlassFish Server deployment descriptors override corresponding settings in the Java EE standard descriptors and in the GlassFish Server configuration. Java EE applications or modules can be packaged with full Java EE 6 compliant standard and runtime deployment descriptors. If the standard deployment descriptors have specified the metadata-complete attribute, annotations in the application or module are ignored. Java EE applications or modules can be fully annotated with metadata defined by the listed specifications. Annotation eliminates the need for Java EE standard deployment descriptors. In most cases, the GlassFish Server deployment descriptors are also not needed. Java EE applications or modules can be partially annotated with some deployment information in standard deployment descriptors. In case of conflicts, deployment descriptor values supersede the annotated metadata, and a warning message is logged. An application is a logical collection of one or more modules joined by application annotations or deployment descriptors. You assemble components into JAR, WAR, or RAR files, then combine these files and, optionally, deployment descriptors into an Enterprise archive (EAR) file which is deployed. A module is a collection of one or more Java EE components that run in the same container type, such as a web container or EJB container. The module uses annotations or deployment descriptors of that container type. You can deploy a module alone or as part of an application. Web Module. A web module, also known as a web application, is a collection of servlets, EJBs, HTML pages, classes, and other resources that you can bundle and deploy to several Java EE application servers. A web application archive (WAR) file is the standard format for assembling web applications. A WAR file can consist of the following items: servlets, JavaServer Pages (JSP) files, JSP tag libraries, utility classes, static pages, client-side applets, beans, bean classes, enterprise bean classes, plus annotations or web deployment descriptors (web.xml and glassfish-web.xml). EJB Module. An EJB module is a deployable software unit that consists of one or more enterprise beans, plus an EJB deployment descriptor. A Java archive (JAR) file is the standard format for assembling enterprise beans. An EJB JAR file contains the bean classes (home, remote, local, and implementation), all of the utility classes, and annotations or deployment descriptors (ejb-jar.xml and glassfish-ejb-jar.xml). If the EJB component is a version 2.1 or earlier entity bean with container managed persistence (CMP), you can also include a .dbschema file and a CMP mapping descriptor (sun-cmp-mapping.xml). Connector Module. A connector module, also known as a resource adapter module, is a deployable software unit that provides a portable way for EJB components to access foreign enterprise information system (EIS) data. A connector module consists of all Java interfaces, classes, and native libraries for implementing a resource module, plus a resource deployment descriptor. A resource adapter archive (RAR) is the standard format for assembling connector modules. Each GlassFish Server connector has annotations or a deployment descriptor file (ra.xml). After deploying a J2EE connector module, you must configure it as described in "Developing Connectors" in Oracle GlassFish Server Application Development Guide. Application Client Module. An application client module is a deployable software unit that consists of one or more classes, and application client deployment descriptors (application-client.xml and glassfish-application-client.xml). 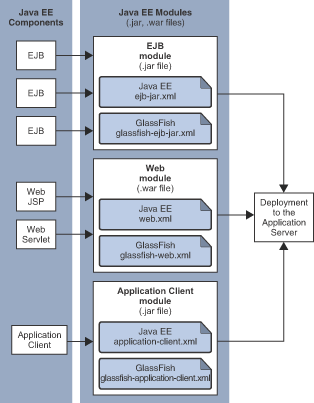 An application client JAR file applies to a GlassFish Server type of Java EE client. An application client supports the standard Java EE Application Client specifications. Lifecycle Module. A lifecycle module provides a means of running short-duration or long-duration Java-based tasks within the GlassFish Server environment. Lifecycle modules are not Java EE standard modules. See "Developing Lifecycle Listeners" in Oracle GlassFish Server Application Development Guide for more information. You can deploy web, EJB, and application client modules separately, outside of any application. Module-based deployment is appropriate when components need to be accessed by other modules, applications, or application clients. Module-based deployment allows shared access to a bean from a web, EJB, or application client component. The following figure shows separately-deployed EJB, web, and application client modules. Description of "Figure 1-1 Module-Based Assembly and Deployment"
Application-based deployment is appropriate when components need to work together as one unit. The following figure shows EJB, web, application client, and connector modules assembled into a Java EE application. Description of "Figure 1-2 Application-Based Assembly and Deployment"
If you assemble a large, shared library into every module that uses it, the result is a huge file that takes too long to register with the server. In addition, several versions of the same class could exist in different class loaders, which is a waste of resources. When Java EE applications and modules use shared framework classes (such as utility classes and libraries), the classes can be put in the path for the common class loader or an application-specific class loader rather than in an application or module. To specify an application-specific library file during deployment, use the --libraries option of the deploy or redeploy subcommand of the asadmin command. To add a library JAR file to the Common class loader directory, the Java optional package directory, or the application-specific class loader directory, use the add-library subcommand. You can then list the libraries with list-libraries and remove the libraries with remove-library. For more information about all these commands, see the Oracle GlassFish Server Reference Manual. For more information about class loaders, see "Class Loaders" in Oracle GlassFish Server Application Development Guide. According to the Java EE specification, section 8.1.1.2, "Dependencies," you cannot package utility classes within an individually-deployed EJB module. Instead, you must package the EJB module and utility JAR within an application using the JAR Extension Mechanism Architecture. Names of applications and individually-deployed modules must be unique within a GlassFish Server domain. Modules within an application must have unique names. In addition, for enterprise beans that use container-managed persistence (CMP), the .dbschema file names must be unique within an application. You should use a hierarchical naming scheme for module file names, EAR file names, module names as found in the module-name portion of the ejb-jar.xml files, and EJB names as found in the ejb-name portion of the ejb-jar.xml files. This hierarchical naming scheme ensures that name collisions do not occur. The benefits of this naming practice apply not only to GlassFish Server, but to other Java EE application servers as well. The Java EE 6 specification also defines the portable module-name element in the module standard deployment descriptors. The name specified at deployment time in the Administration Console or in the --name option of the asadmin deploy command is used. If no name is specified at deployment time, the portable application-name or module-name in the Java EE deployment descriptor is used. If no name is specified at deployment time or in the deployment descriptors, the archive name, minus the file type suffix, is used. Java Naming and Directory Interface (JNDI) lookup names for EJB components must also be unique. Establishing a consistent naming convention can help. For example, appending the application name and the module name to the EJB name is a way to guarantee unique names, such as, jms/qConnPool. Application and module directory structures must follow the structure outlined in the Java EE specification. During deployment, the application or module is expanded from the archive file to an open directory structure. The directories that hold the individual modules are named with _jar, _rar, and _war suffixes. If you deploy a directory instead of an EAR file, your directory structure must follow this same convention. For instructions on performing directory deployment, see To Deploy an Application or Module in a Directory Format. There are two JSR 88 APIs that can be used to deploy applications in GlassFish Server. Because there is no file name, the name of the application is taken from the application-name or module-name entry in the Java EE standard deployment descriptor. If the application-name or module-name entry is not present, GlassFish Server creates a temporary file name and uses that name to deploy the application. Neither the Administration Console nor the asadmin utility uses this API. For more information about JSR 88, see http://jcp.org/en/jsr/detail?id=88. Application and module versioning allows multiple versions of the same application to exist in a GlassFish Server domain, which simplifies upgrade and rollback tasks. At most one version of an application or module can be enabled on a server any given time. Versioning provides extensions to tools for deploying, viewing, and managing multiple versions of modules and applications, including the Administration Console and deployment-related asadmin subcommands. Different versions of the same module or application can have the same context root or JNDI name. Use of versioning is optional. A module or application without a version identifier is called the untagged version. This version can coexist with other versions of the same module or application that have version identifiers. In some deployment-related asadmin commands, you can use an asterisk (*) as a wildcard character to specify a version expression, which selects multiple version identifiers. Using the asterisk by itself after the colon selects all versions of a module or application, including the untagged version. The following table shows example version expressions and the versions they select. The following table summarizes which asadmin subcommands are identifier-aware or expression-aware. All expression-aware subcommands are also identifier-aware. The create-application-ref subcommand is expression-aware only if the --enabled option is set to false. Because the --enabled option is set to true by default, the create-application-ref subcommand is identifier-aware by default. The list-applications and list-application-refs subcommands display information about all deployed versions of a module or application. To find out which version is enabled, use the --long option. At most one version of a module or application can be enabled on a server instance. All other versions are disabled. Enabling one version automatically disables all others. You can disable all versions of a module or application, leaving none enabled. The --enabled option of the deploy and redeploy subcommands is set to true by default. Therefore, simply deploying or redeploying a module or application with a new version identifier enables the new version and disables all others. To deploy a new version in a disabled state, set the --enabled option to false. To enable a version that has been deployed previously, use the enable subcommand. Use of the --name option is mandatory for modules and applications that use versioning. There is no automatic version identifier generation. GlassFish Server does not recognize any relationship between versions such as previous or later versions. All version relationships must be tracked manually. There is no limit to the number of versions you can deploy except what is imposed by disk space limits. A module or application in a directory should not be deployed twice with a different version identifier. To redeploy a module or application from a directory with a new version, you must use the --force option of the deploy subcommand. Database tables created or deleted as part of deployment and undeployment are global resources and cannot be qualified by an application version. Be very careful when using global resources among versions of the same application. Web sessions are preserved during redeployment of a new version. However, preserving sessions among different versions of the same module or application is complex, because the key used for session variables is the same for the old and new versions. Resources are created with reference to a resource-adapter's module or application name. This means that an older version's resources do not automatically refer to a newer version of the module or application. Therefore, you must explicitly create resources for a newer version of a module or application. GlassFish Server ignores duplicate exported global resources and lets deployment succeed. OSGi already has its own versioning system. Therefore, when you deploy an OSGi bundle, GlassFish Server ignores any version information provided with the name but permits the deployment to succeed with warnings. The deployment tools that are provided by GlassFish Server can be used by any user authorized as an administrator to deploy applications and modules into any GlassFish Server environment. However, effective application deployment requires planning and care. Only the developer knows exactly what is required by an application, so the developer is responsible for initial assembly and deployment. Deployment Descriptor or Annotation Creation. The developer creates the deployment descriptors or equivalent annotations using Java standards and tools. Details of the GlassFish Server deployment descriptors are contained in GlassFish Server Deployment Descriptor Files and Elements of the GlassFish Server Deployment Descriptors. The GlassFish Server sample applications contain deployment descriptors that can be used as templates for developing deployment descriptors. Assembly. The developer assembles the archive file(s) using Java standards and tools, such as the jar command. The application or module is packaged into a JAR, WAR, RAR, or EAR file. For guidelines on naming, see Naming Standards. There are no GlassFish Server issues to consider. Test Deployment. The developer performs a test deployment of the archive. For instructions, see To Deploy an Application or Module. Archive Submission. The developer submits the verified archive to the administrator for deployment into a production environment. The developer includes instructions for any additional deployment tasks that the administrator must perform. For an example of such additional instructions, see Access to Shared Framework Classes. Configuration. The administrator applies additional deployment specifics. Sometimes the developer has indicated additional deployment needs, such as specifying the production database. In this case, the administrator edits and reassembles the archive. Production Deployment. The administrator deploys the archive to production. See To Deploy an Application or Module. Troubleshooting. If deployment fails, the administrator returns the archive to the developer. The developer fixes the problem and resubmits the archive to the administrator. Sometimes the administrator resolves the problem, depending on what the problem is. GlassFish Server provides tools for assembling and deploying a module or application. Step-by-step instructions for using the Administration Console for deployment are provided in the Administration Console online help. You can display the help material for a page by clicking the Help button. The initial help page describes the functions and fields of the page itself. To find instructions for performing associated tasks, click a link in the See Also list. Application deployment commands are listed in The asadmin Deployment Subcommands. All GlassFish Server asadmin subcommands are documented in the Oracle GlassFish Server Reference Manual. For additional information on the asadmin utility, see "Using the asadmin Utility" in Oracle GlassFish Server Administration Guide and the asadmin(1M) help page. You can use the NetBeans Integrated Development Environment (IDE), or another IDE, to assemble Java EE applications and modules. The NetBeans IDE is included in the tools bundle of the Java EE Software Development Kit (SDK). To download, see http://www.oracle.com/technetwork/java/javaee/downloads/index.html. For additional information, see http://www.netbeans.org. In addition to the bundled NetBeans IDE, a plug-in for the Eclipse IDE extends GlassFish to the Eclipse community. To download, see http://glassfishplugins.java.net/.